We develop microcontroller based systems on various platforms such as ARM / PIC / ATMEL / STM32 / NUVOTON / RENESAS / TEXAS INSTRUMENTS. We have been working in the feild of embedded systems and electronics since last 10 years. We have worked on various industrial projects ranging from motor control to remote data aquisition systems. Keeping in mind the various requirements of the customers, we are involved in providing Payroll Management Software Solution. 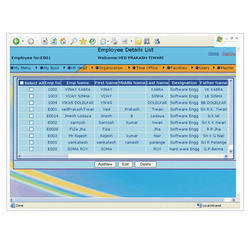 A suite of scheduling software which provides complete control and accountability within any given operating environment. Banking on the understanding our personnel have received in the years, we are engrossed in the business of offering Website Designing Service services to our clients. Credited due to their reasonable rates, these services are widely appreciated amongst our clients. More to this, our adroit workers are rendering these services in the most planned manner. Best quality of MIS Software Development Service is provided by us to customers as per their requirements. Software Development Services from Mumbai, India. Ready Product . Just need to customize as per the clients requirements. Self Censor is designed to blur inappropriate images on your devices. Optical Software Service is provided by our experts to our clients all over the india. With the assistance of our qualified and highly talented team, we are engaged in delivering to our clients’ an efficient Software Development Service. As per the needs and requirements of our customers, these services are highly demanded in the market. We are highly recommended among the customer for providing them a reliable service. We offered these services at market leading rates. Capitalizing on the ability of our well-trained workforce, we are readily engaged in providing world-class IT Software Development Service. A team of well-trained staffs is offering these services as per the thorough demands of our clients. We believe in offering precise solution of client’s needs and assist them accordingly.